The Wall Street Collectors Bourse IV took place at the Museum of American Finance in New York (MoAF.org), Thursday through Saturday October 23-25, 2014. 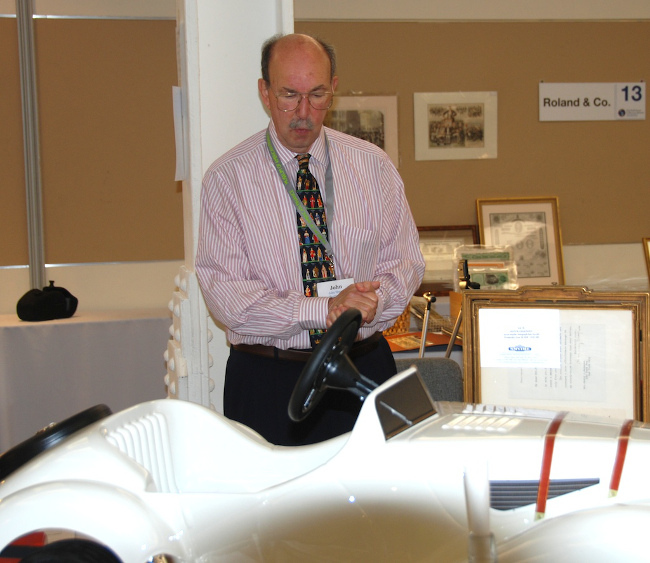 The show hosted dealers in coins, banknotes, stock and bond certificates, autographs and other financial memorabilia, and included an auction by Archives International Auctions. John Herzog and his crew put in a lot of work to make the show a success. For the scripophily crowd, it would be nice if we could re-create the Strasburg shows of old, but sadly those days seem to be behind us. Still, I found a number of items to buy and there was a slight uptick in scripophily dealer attendance, with Fred Fuld making it all the way from California to take a table and Stephen Goldsmith bringing retail inventory. Also with scripophily tables were Larry Schuffman, Larry Falater and Lee DeGood, Roland & Co/Robin Majlak, Spink, and Champion Stamp. No European dealers or auctioneers took tables, and none were seen on the bourse floor. This year John generously donated a table for hobby groups to display information. I manned the table for a while, carrying the flag for scripophily though I had no competition from anyone else. I saw a few scripophily collectors I knew already, but not many. Groups of students came through, the kids evidently being selected from magnet or gifted schools – the youngsters were notably bright and curious. 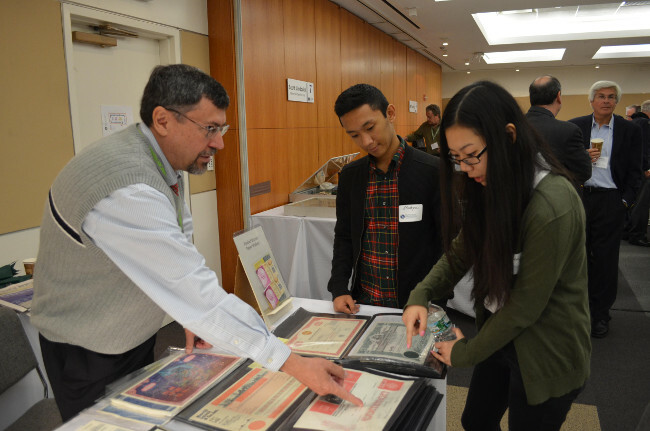 Many were interested in the color copies of various old stock certificates I was giving away with the Society membership application on the back. At the end of the show 25 of these copies had disappeared one way or the other. So far, one has come back with a membership check. Larry Schuffman’s enthusiasm is a delight to behold. He is particularly good with the kids, handing out free banknotes and trying to hook the “big spenders” with obsolete Yugoslav banknotes sporting an image of Nikolai Tesla for a dollar. Last year Champion Stamp brought a few boxes of American Bank Note Co specimens they characterized as being in their inventory in “ones and twos”. This year they brought 45 boxes containing an example of everything in their specimen inventory, up through “P” in the alphabet. Stamp and bank note collectors value specimens as the “only examples available”, often pricing them higher than the often lower-grade issued examples. Surprisingly, we haven’t arrived at that point yet in scripophily. Lunchtime on Thursday or Friday, working days on Wall Street, might have brought in some curiosity seekers, but I noticed little increase in attendance around these times. I attended the bourse practically all the time it was open to the public. I met no one who was just dropping in from the local financial industry. On its face this event should bring in many new potential collectors from the industry literally outside the door. They don’t know what they are missing! I was quite satisfied with what I found to buy, and I wrote off the high NYC costs as a vacation. 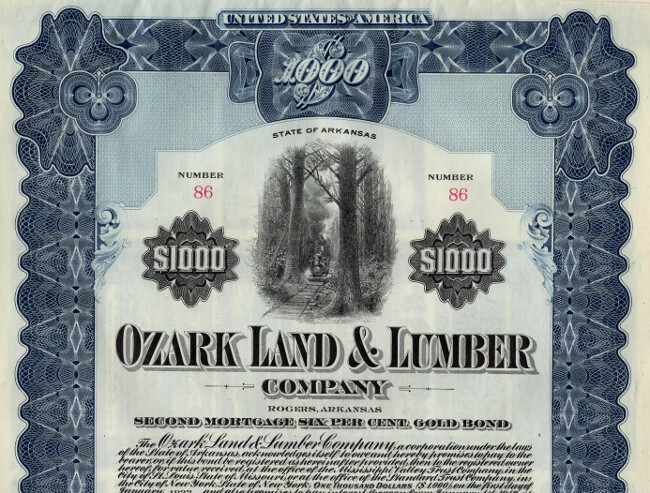 One fun item for me was Larry Falater’s issued, uncancelled bond in the Ozark Land & Lumber Co. I grew up in St. Louis, MO. My family took many vacations in the Missouri Ozarks region, camping, fishing and hiking. The countryside was clear-cut logged from 1890 – 1912, leaving a lot of traces today. Old railroad bridge pilings snared our canoes, and the rivers were choked with gravel from erosion. This company operated one of the largest sawmills in the region. There are no known stock certificates, and this is the only bond I’ve seen. It was issued in 1912 to finance land sales so the company could get rid of the denuded hills. he land was (and is) rocky and infertile, so it’s easy to see why none of the coupons except the first 3 were paid. This is an example of finding your history through scripophily. 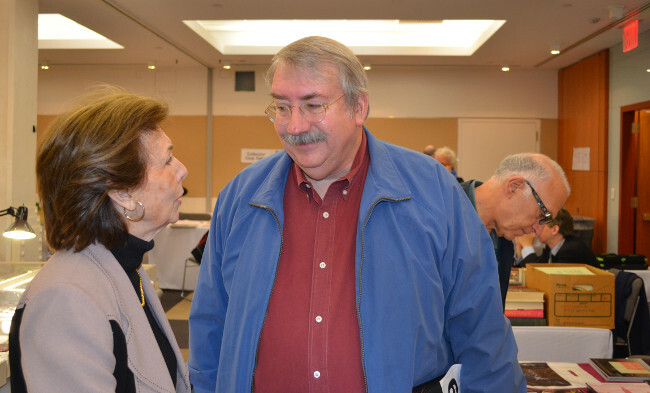 John Herzog spoke on the Penn Central hoard at last year’s breakfast. This was a tough act to follow, but I took the opportunity this year to speak on a subject that has interested me for a while – how to publicize our hobby. YouTube is my choice for “how to” videos on cooking, pet training, home repairs and other practical topics. Why not a YouTube video on scripophily – from the collectors’ point of view? Take a look at YouTube yourself. Search under “scripophily” for best results. Without revealing the end of the movie, the best we can say about the current offerings is that they are “unsystematic”. Despite this, the better ones (auction results, press interviews) have gottn around 2,000 views in 2 years. If only 4% of these viewers joined the Society every year we could neutralize our drip-drip-drip of membership losses. The Society could do newcomers a service by preparing a video on the subject. And it would help drive traffic to the Society website. My Breakfast talk was intended to expose some “experimental subjects” to draft content for scripophily-the-movie. There were around 10 attendees. No total neophytes, but a few who were fairly new to the hobby. 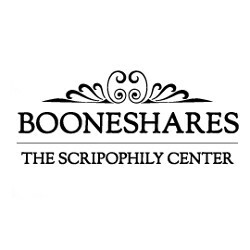 Subjects covered were (1) What is Scripophily?, (2) Is Scripophily a new hobby?, (3) What are stock and bond certificates?, (4) What are obsolete stocks and bonds Worth? (“live” certificates and factors affecting market value for obsolete ones) (5) Where do old stocks and bonds come from?, (6) Why collect obsolete stocks and bonds (high ratio of rarity to price, “cherry-picking” opportunities, historical content, absence of condition mania, artistic merit}, (7) What are the ways to collect stocks and bonds? (autographs, printers, topical/geographical/industrial fields) and (8) What are some tips on collecting “smart”? (take your time, join collector organizations, subscribe to publications, find a variety of buying sources, use scripophily guides, research the historical record, and understand condition and valuation issues). I got some valuable input after the talk, particularly “good luck on stuffing all that content into a 15 minute video”. 15 minutes is the largest unrestricted YouTube submission size. Good point. While videos up to an hour are possible on the site, we’d probably lose most visitors’ interest before then. Twenty minutes with arresting images and stories is probably the maximum. I’d be grateful to hear from anyone who has experience preparing documentary videos for YouTube. I’d welcome help preparing the script and obtaining selecting images and sound track (not limited stocks/bonds either). Also useful would be financial contributions. I doubt that this is something I want to finance out of my wife’s “pin money”. We should present the image of a serious hobby, not something like Billy Bob’s Mardi Gras Vacation. If you know how to get James Earl Jones to narrate it please let me know. 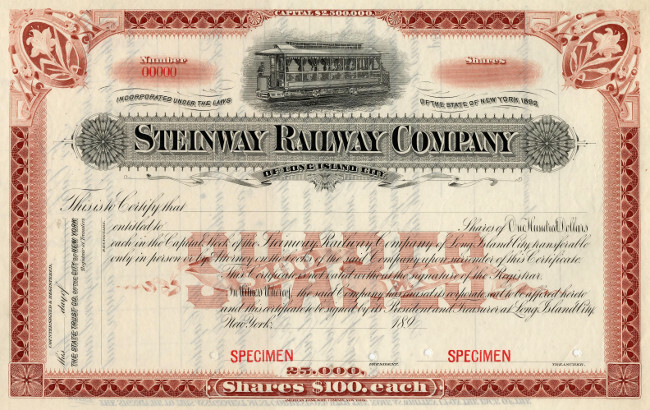 The Steinway Railroad Co was a Brooklyn trolley line organized by Steinway of the piano firm. 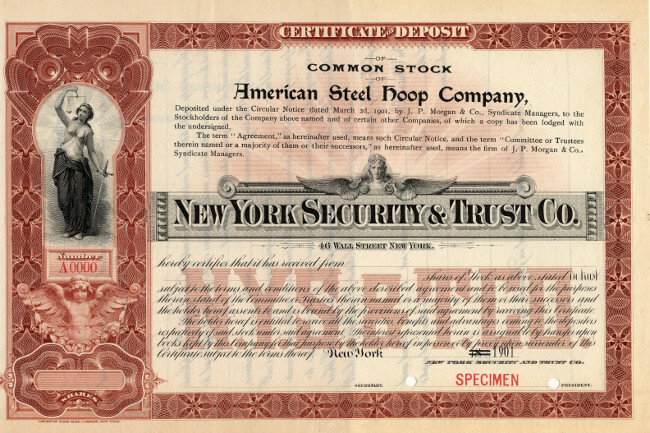 The American Steel Hoop Co American Bank Note Co specimen certificate, when issued, functioned as a receipt for American Steel Hoop Co shares submitted to the 1901 United States Steel Co consolidation.